The City, through its social organisation DESIGNING_SOUTHAFRICA (D_ZA), and in collaboration with the City of Johannesburg, the Johannesburg Development Agency (JDA) and the Passenger Rail Association of South Africa (PRASA) is developing a placemaking project at Johannesburg’s central station. 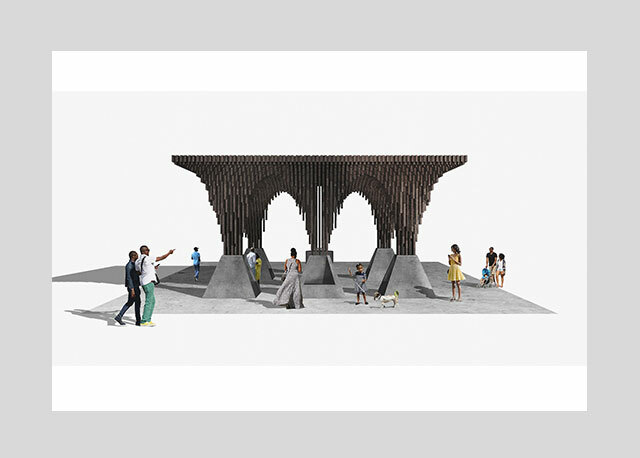 A component of this project is a public pavilion, designed by world-renowned architect David Adjaye OBE and working with a Johannesburg team of architects, engineers and contractors. To be constructed in a public space in Johannesburg’s prominent Park Station, the project will highlight this historical junction in the city, while activating under utilised public space using innovative design alongside neighbourhood and stakeholder engagement. The project is iconic in that it will demonstrate the role of good design in creating and facilitating meaningful city space. The structure will create new public areas for residents of and visitors to Johannesburg, in a manner that allows people to slow down and take in the city. A beacon for future urban interventions in Johannesburg, we hope to open up vaulted spaces in the city for all to utilise and enjoy. D_ZA hopes that this project will serve as a benchmark to explore ways in which design and the procurement of design for the South African public and public infrastructure can be reconsidered and better managed. The programme for the launch of the public pavilion engages with partners from academic, cultural, architectural, community and transport fields to activate the space in and around the pavilion and the city of Johannesburg. Each element brings a unique and multi-dimensional facet to the discussion and interactions around the pavilion, inviting an open discourse about movement and public space.